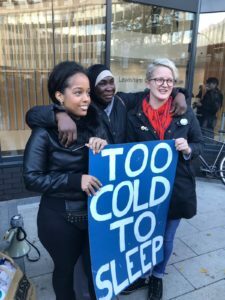 Will Lewisham Council, Quintana Global and District Homes continue to force tenants to live in unsafe flats that are making them ill? 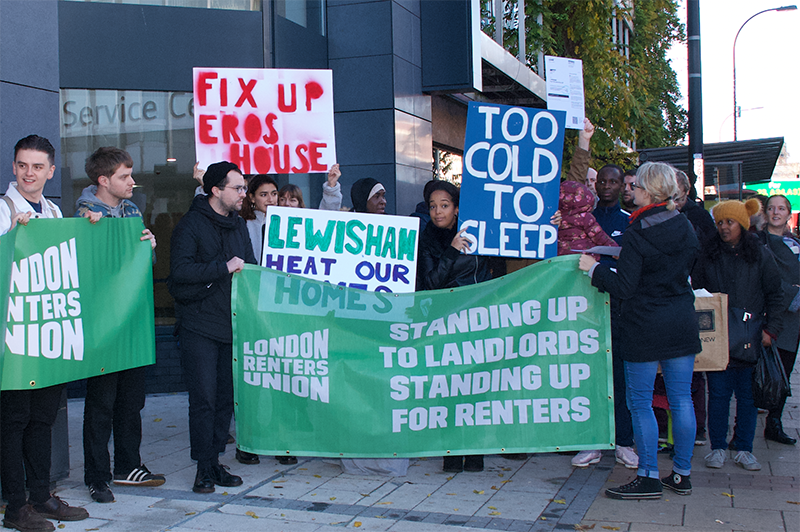 London Renters Union members living in temporary accommodation in Eros House, a tower block in Catford, got together in November last year and demanded action from Lewisham Council, Quinata Global (who own the building) and District Homes (who manage the flats) to improve appalling conditions. Their protest – at which they were joined by other LRU members from all over the city – led to some important wins. Mayor Damien Egan and Lewisham Council now accept that they have a responsibility, as a local authority that has placed residents in the block, to pressure the owners and management to ensure the building is habitable. Arrangements were made for flat inspections to be carried out and essential maintenance work was done as a result, including replacing a number of faulty windows and heaters. This work, along with the renovation of parts of the communal areas, has gone some way to improving conditions in the block. When we organise together, we can win! However, the council, management and owners are still failing to address some of our members’ biggest concerns. In January, a number of members met with officers from Lewisham and District Homes. One of the main concerns raised at that meeting was security, and in particular issues with the main entrance to the block. These same concerns had been raised by members in a similar meeting last summer, but no work had been carried out. Despite promises from Lewisham that they would provide a schedule for essential work to be carried out within days of the January meeting, it’s now two months later and no schedule has been received, no work done. The building is still not secure. The owners are failing in their duty to provide a secure home for their tenants, while the council is failing to enforce the most basic of standards. ‘I fear for my children every time we meet someone in the corridor. It’s extremely dangerous and we need to protect our families. […] We have been complaining about the broken front door for months and months,’ says Aisha, who lives in the block. Families in Eros House, the majority of whom are from BAME communities, have waited for long enough. Why won’t the Mayor and Lewisham Council ensure their homes are at least secure? Since April last year, members in Eros House have been complaining about the mould in the building. A number of adults and children in the block suffer from asthma, which their parents say has been caused or aggravated by the mould. 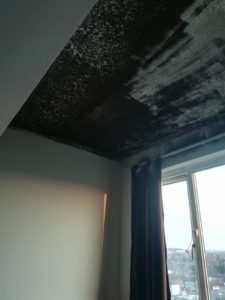 Lewisham and District Homes have always looked to minimise residents’ concerns, often saying that the mould is the result of their ‘lifestyles’. But, since November, at least three other local authorities have moved residents out of the block, citing hazardous conditions. Many residents continue to report problems with mould. It’s time for Lewisham to take them seriously and be proactive in inspecting every flat in the block. If conditions in some of the flats are hazardous, it’s likely other flats are in a similarly dangerous condition. Will Damien Egan and Lewisham Council continue the work they’ve started and make sure that Eros House is a secure, safe, healthy place to live?